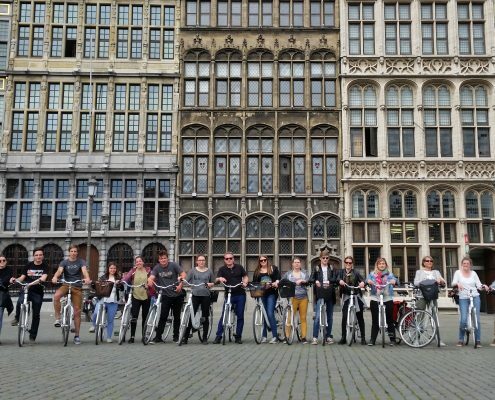 Do you want to organize a private bike tour through Antwerp with one of our guides? 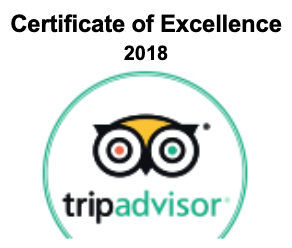 Private tours are possible any day of the year! You can combine a visit to the brewery with the highlights tour and the beyond the centre tour. In the belgian beer tour, it’s already included. Our bikes are located at the Steenplein, in the city center, and that’s where our tours start. Do you prefer starting at another location? If you participate with your own bikes, you can choose any starting point, as long as it makes sense for the tour you have chosen. If you want to rent our bikes, and start at another location, we can transport them to your departure point of choice for an additional price of 8 euro per bike. 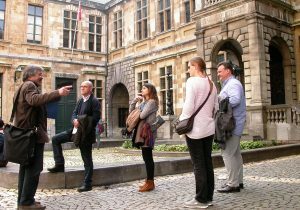 Our guides are citiziens of the world! That’s why we can offer our tours in many languages: English, Dutch, French, German and Spanish. Kickbikes: great for a 2 hour tour, but a bit more exhausting than bikes. Streetsteppers: for groups who want to combine a sightseeing tour with a unique workout! You pay a surcharge of 12 euro per participant. Great for people of all ages – children are welcome! We provide YEPP-child seats for the youngest participants – for free. We have children bikes for kids until the age of twelve. Whoever needs one, can get a helmet. Then we will keep you as dry as possible. Read more about our rain guarantees.